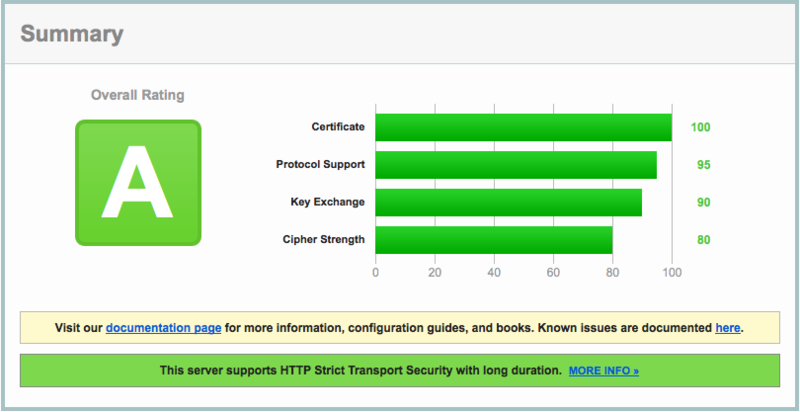 List the steps, per release, to obtain an A+ in the Qualys SSL Labs Security Test. This wiki requires using the CLI as some options are not available via the Admin Console. Please note: obtaining the best results via the SSL Labs test may not align with your business requirements or environment (e.g. you are still running old equipment like Windows XP, use older Java clients, etc.). Tune your environment according to your needs. ZCS 8.7.x/8.8 defaults to using a 2048-bit DH parameter (bug 99558) which come from RFC3526 IKE 2048-bit PEM (group 14) for anything in ZCS that utilizes OpenSSL. In 8.7.x you can generate new/custom DH parameters using a new utility zmdhparam which calls openssl dhparam. zmprov mcf +zimbraResponseHeader "Strict-Transport-Security: max-age=31536000"
If you want to disable some remaining weak ciphers, please take a look to the next step as well. ZCS 8.6 has a default 1024-bit DH parameter. Best practice is to use at least 2048-bit and that is the minimum for an A+ with Qualys SSL Labs. Thank you to Alex that wrote these steps months ago. If the Logjam steps were not performed, you will obtain a B. By default, ZCS 8.0.x generated CSRs with SHA1 instead of the now preferred SHA256 hash. Edit /opt/zimbra/bin/zmcertmgr as root to change the default. Use the Administration Console and CLI Certificate Tools to generate the new CSR (now with a SHA256 hash). Follow How to disable SSLv3 to disable SSLv3 in your ZCS 8.0.x environment. Now you have nginx properly enabled. Zimbra 8.0.x has a default 1024-bit DH parameter. 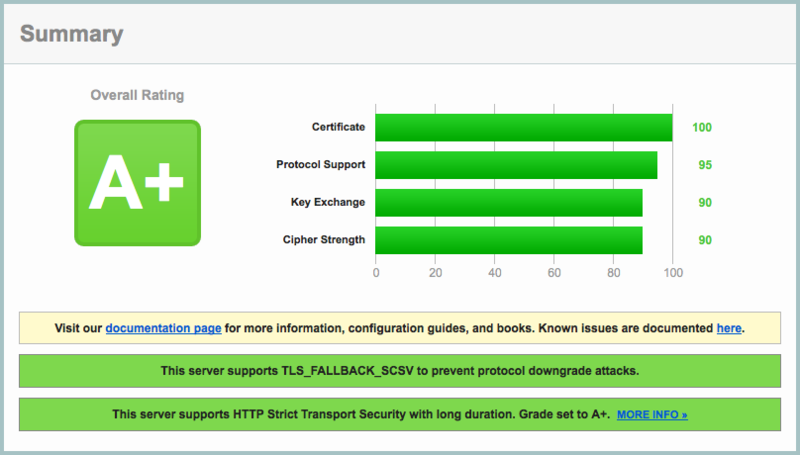 Best practice is to use at least 2048-bit and that is the minimum for an A+ with Qualys SSL Labs. 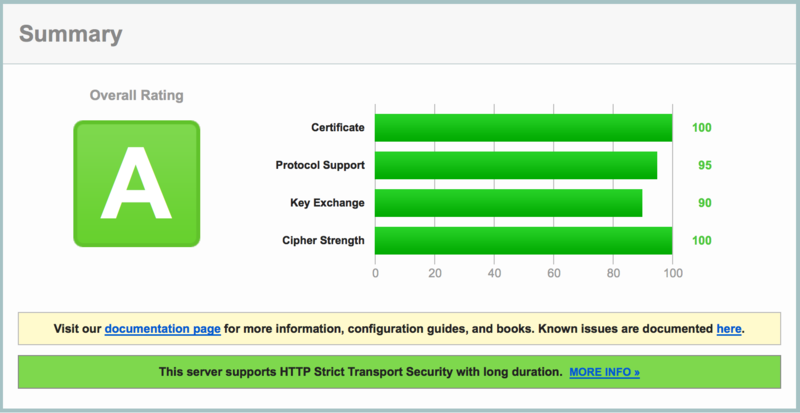 The result using a valid SSL commercial certificate, and ZCS 8.0.9 Proxy, in the SSL Labs test will be an A+ if you followed all the steps. Thank you to Irontec to wrote the next Blog entry about how to generate CSR with hash SHA256.